WALLED LAKE, Mich. – August 3, 2015 – Customer retention and lead generation specialists, Continuity Programs, has launched a new ecommerce portion of their website. The brand new small business marketing store includes customizable marketing campaigns that can be ordered online. The store was built to help small businesses keep in touch with their customers, market events, advertise sales, and generate leads. 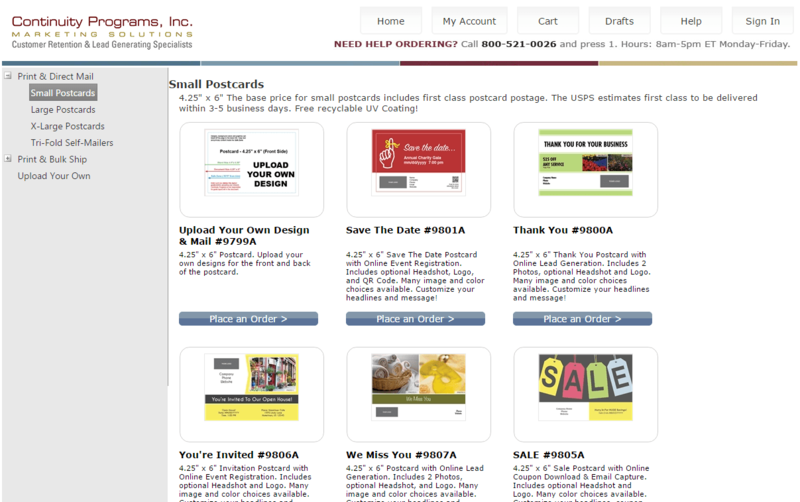 The small business marketing store allows Owners or Marketing Managers to easily design unique direct mail postcards and order printed media based on their company’s needs. Products include invitation postcards with online event registration, sale mailers with online coupon download and email capture, thank you postcards with online lead generation, and more. Companies with graphic designers can upload their own designs to be printed. There are a few features that make these products attractive to small businesses. All of them can be completely customized with just a few clicks. The colors, headlines, photos, coupons and messages can be tailored to any business. Some of the self-mailers offer a postage-paid reply card and online lead form that allow customers and prospects to let the business know what services they are interested in, and when. The services advertised are defined when ordering the media. About Continuity Programs: Continuity Programs (https://www.continuityprograms.com) is a Michigan-based database marketing firm that has been proudly serving North American businesses since 1973. It serves wide spectrum of industries, including financial and mortgage, real estate, moving, heating and cooling, home performance, legal, automotive and child care. The company provides a variety of customizable turn-key systems, including personalized direct mail and e-mail campaigns, customer retention and lead generation programs, customer satisfaction surveys and intelligent database marketing.